This year marked the 100th anniversary of The Festival of Nine Lessons and Carols at King’s College Chapel. And, before the grammar Nazis pick me up on the extra apostrophe in the title, this Carol was there too. While I normally watch Carols from King’s on TV, glass of fizz in hand, this Christmas we made an early start to attend the real thing. Why are the hoomins up at 2.30am? Because, dear Mishmish, this is what the queue for tickets looked like at 3 am. Yes, it really was that early, and tickets weren’t going to be handed out till 7am. Not that I’m complaining. Some people had camped outside the college for three days, despite the rain. The weather was fine when I got there, if a little chilly. No wonder people had their warmest coats, hats, sleeping bags, sheets of tin foil, etc. The motley crowd had more than a touch of the Canterbury Tales, with people from all over. Originally a gift to the people of Cambridge, the Festival of Nine Lessons and Carols is now a gift to the world. The queue is finally on the move. And here’s where the precious tickets are handed out, but only if you remembered to bring ID. Now it’s time for the hardy types to pack up and go home for a few hours’ rest. Totes got the hang of this. It must all fit. Although… could be worth turning the bike around. Maybe a couple of minor adjustments. And here’s yet another happy camper, complete with dining chair. No idea who this was, but they were a lot more stylish. Outside King’s Chapel around 2pm. Building started on the chapel in 1446 under Henry VI and took over a century to build. It has the largest fan vault ceiling anywhere, and some of the finest medieval stained glass. Just before the service began, it looked like this. As always, the opening carol is ‘Once in Royal David’s City’, starting with a spine-tingling solo voice from the back of the chapel. There’s always a new, specially commissioned carol. The 3pm service is not the Carols from King’s, which is pre-recorded for BBC TV earlier in December, and broadcast a couple of hours later on Christmas Eve. You can see the 1918 Order of Service here. The crowd files out into the dusk. Mist had already descended over the Backs. By contrast, we slept well into Christmas Day. Christmas dinner was at Six, a restaurant with 360⁰ views of the city. This view shows Charlotte and Harriet asking the waiter whether the gravy is vegetarian. This shot of St John’s Chapel didn’t turn out quite as planned, but it’s jolly all the same. Here’s hoping you all had a wonderful Christmas. See you in the queue next year? If you consider summer a tad too warm in the UK, spare a thought for those who spend this time of year in Washington, DC. The suburbs are tolerable but the city is hot and humid, as I well know from the years my mother and I lived there in a cramped apartment in Foggy Bottom. Nobody much considered the environment in the Sixties, and most buildings were fiercely air conditioned at the time. The outside, of course, is not, until evening sets in and the scent of honeysuckle fills the air. It was just as the Lovin’ Spoonful described in their 1966 hit Summer in the City. The mercury regularly hit the mid to high 90s, or about 34⁰-37⁰ C. I took my driving test one August around midday in a VW Bug aka Beetle (no air con). The Dept of Motor Vehicles takes your photo for the licence just after you pass, and for the next five years my sweaty physiog was a glamorous reminder of the occasion. The Potomac may look inviting, but it’s polluted. If you wanted to cool down, you had to head to a pool. One of our favourites was the public pool on Volta Place, Georgetown, which is still open. The queues were often long, but entry was free though I think the rudimentary lockers required a dime. There wasn’t much there about from the pool and concrete all around. I remember a couple of Egyptians who loudly admired my 14-year old derrière, until my mother yelled at them in fluent Arabic. Rock Creek Park runs across the NW segment of DC. It now has a lot more organized leisure facilities than it did back then, when it was little more than a haven of shade. My best memory of the park was a summer day camp run by the recreation department. It was free for city kids and my mother wangled three consecutive placements for me, so I spent six happy weeks identifying leaves, creating shoe racks out of fallen branches, and singing the campfire classic We Ain’t Got the Money for the Mortgage on the Farm. Inexplicably, we also put on a nativity play. Yes, in August. It was as hot as hell wearing the Virgin Mary’s cloak. I don’t plan to go back to DC just yet, but I will be visiting my US family as usual later this summer. Meanwhile I’d love to hear your summer memories and great suggestions for keeping cool. You may also enjoy The March on Washington. I’ve blogged before about Suez, because it’s when my mother wrote her first book. This week, Nadia, a character from my next novel, gives her own take on 1956. It began on July 26, when I was ten and a half years old, or, as I preferred to say, nearly eleven. The whole affair was about a canal and a dam. Here’s the crucial thing: President Gamal Abdel Nasser was most interested in canals and dams. Nasser was a very big man, with a strong jaw and huge teeth that he displayed whenever he smiled. That night in 1956 was the anniversary of the revolution, so the president celebrated by giving a long speech, right here in Alexandria, in Mansheya Square, where there’s a massive statue of Mohammed Ali Pasha, wearing a turban and brandishing his sword, sitting atop his horse. As usual when anything interesting happened, I had been sent to bed instead of being allowed to stay up. My parents told me about the speech the next day, which is hardly the same thing. I relished the idea of Nasser brandishing his words like a sword, and I was especially sorry to miss the firemen dispersing the crowds. Although I had no real opinions on politics, I liked listening to the president on the radio. Unlike a lot of important men who like to make themselves sound clever by speaking in a formal version of Arabic, Nasser spoke a colloquial language that every Egyptian could understand, even a child of nearly eleven. That, I thought, was much cleverer. The day after that big speech, my sister Simone and I sat in the upstairs living room right by the air conditioning, which was on at full blast as it was sweltering. Father and Mother explained to us that the Suez Canal was now going to belong to Egypt instead of France or Britain. As a result, it would raise lots of money for Egypt, and would pay to build a High Dam at Aswan. Mother actually put down her embroidery during this conversation, so it must have been significant. Quite how significant, I did not wholly grasp. The main thing was that the Suez Canal had been nationalized. That was a good thing, wasn’t it? Unless you happened to be British or French, like some of my friends from school. In October, a few countries turned out not to be so happy about Egypt having the Suez Canal. Our parents did not explain that very clearly. Meanwhile, our nanny Rashida lit more candles than ever to the Virgin Mary and to St Anthony. Even when she wasn’t praying, Rashida went about muttering to herself. I thought I heard her say that things had been much better under King Farouk, but, when I asked her to repeat herself, she flatly refused. It got a lot clearer when France, Britain, and Israel all ganged together to declare war on Egypt. Every night there were air-raid sirens and anti-aircraft guns. Victor, my pain of a cousin, kept going on about it. With our schools shut, he was unfortunately at our house more often than ever. According to him, the guns were as close as Smouha, barely a few kilometres from us. I pretended to be unconcerned. Every bedtime, Mother told Simone and me that things would turn out all right. We had blackout paper on all the windows now. It was all going to be fine, Mother said. It did however change things for many of my friends, and for my teddy bears, at least one of whom was British. In her own words, this is how my mother came to write her first book. We were staying with my parents in Alexandria, and, as it turned out, I was only allowed out of the house at certain hours of the day. It was a sort of house arrest (résidence forcée). There was nothing much to do in autumn 1956. It was October, a lovely month in Egypt, when summer’s heat and humidity are over, and it is pleasant to be out of doors. One morning, I sat down under the mimosa tree, with the sound of white doves cooing in the dovecote, and began to write my first book, Cocktails and Camels. I never thought of any other title. Apart from school essays and letters, I had never written anything before. I wrote in pencil, painstakingly, while my young daughter Carol picked daisies on the lawn. As I searched for the right words, they popped up like magic. I was elated. Writing my first book had nothing to do with my wanting to be ‘a writer’. It just happened because the circumstances and my state of mind were attuned. Although the country was at war, Gamal Abdel Nasser was on a nationalization spree, and the future looked uncertain, I felt peaceful and content. Maybe that is what writing does for you. The writing did not always come easily. Every line was written and rewritten a dozen times or more. I did not mind. Every time I corrected a sentence, I could see it getting better. Writing was a challenge, and I enjoyed it. I’d walk around the garden, mulling things over. Sometimes I’d laugh aloud at what I’d written. “I’m going to write a book too!” Carol piped up. Friends came to visit and have tea. I told them I was writing a book, and that it would be called Cocktails and Camels. “Je déteste le bridge!” We always spoke like that in Alexandria, switching from one language to another all the time. Anyone who did not was not a true Alexandrian. Annoyed that I always refused to play bridge, they were soon asking if I was planning to mention them in my book. “Of course.” How could I not include them? They were such characters. But I would do it with humour, and make up names to disguise their identities. “Will you say that I am the best dressed woman in Alexandria?” asked Yvette who wore a different outfit every day. We laughed. My father, who for more than thirty years had been the respected President of La Bourse de Contrats en Egypte, had published an excellent and much acclaimed book on the Bourse. I thought he would be pleased to hear that I too wanted to write a book. One evening, with Carol asleep in her cot, I told my parents that I was working on a light-hearted autobiography called Cocktails and Camels. Their reaction was not what I had expected. There had been censorship in Egypt for years, and one was careful what one wrote in letters and newspapers, let alone books. Sometimes, foreign magazines were sold with articles missing, cut out by the censors. To be on the safe side, I changed not only the names of friends and relatives, but, to be sure no one recognized the family, I wrote that I had two sisters instead of a sister and a brother. My brother Théo was never mentioned in Cocktails and Camels. As for a pen name, I would be Jacqueline Carol, using my own first name and my daughter’s first name as a surname. “You can’t afford to publish a book,” Father then said. “Who cares about nice girls?” I howled as I stormed out of the room. Cocktails and Camels was published in New York in 1960. Now sadly out of print, it portrays Egypt in an earlier time – الزمن الجميل – and is still one of the funniest books I have ever read. Not that I’m at all biased. This week, I take an exclusive peek inside one of the most creative and fun book blogs I’ve come across – Jessie Cahalin’s Books in My Handbag. By now, we’ve all heard of Books Are my Bag, but blogger and author Jessie Cahalin takes books and bags a step further with Books in My Handbag, including Handbag Adventures and a beautiful Handbag Gallery that now features over 130 books. Jessie, what first made you think of pairing books with handbags? Jessie: Once upon a time, my shelves were groaning with the weight of a lifetime of purchases. We didn’t have the money to move, so I had to take the books to the charity shop. Several weeks later, after many car trips, I realised I was throwing away all the voices that had influenced me over the years – but then Mr Kindle came to the rescue. All the narrative voices are in my handbag – result! I decided to share the influential books, located on the Kindle in my handbag, via a blog and that is how Books in my Handbag was created. I shared ten book reviews on my blog, and was overwhelmed with requests from authors wanting to put their books in my handbag. Authors tweeted me with comments about my handbag and their favourite handbags. I came up with the idea of authors showcasing their books in their handbags. The Handbag Gallery was an instant success. Every single composition sets the scene and tells a story, and each photo is linked to Amazon or the author’s website. Me: Your delightful settings and the entertaining stories you weave are as much a part of the interview as the questions you ask. I love the one in which you share a special tea with one author. Jessie: In preparation for this interview with Annabel Fielding, I visited Bath Market to collect some tea. I drank the tea at home and imagined a shortbread to compliment the tea. I have written a blog post about selecting the various teas, but haven’t posted it yet. Me: How do you get your inspiration for the interview settings? Jessie: Sometimes, I choose a setting based on what the author says in the interview. Jenn Bregman told me she is an adventurer, so it seemed obvious that we climb Pen Y Fan, in the Brecon Beacons. There are occasions when I get inspiration when I am visiting a place. 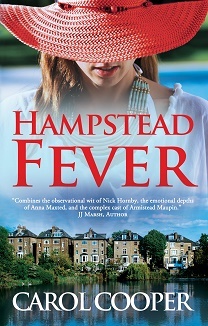 For instance, I suggested we meet in Cardiff Bay, as I heard some medical students chatting on their graduation day thus it seemed serendipitous to discuss Hampstead Fever there. Adrienne Vaughan quoted Churchill in her interview: ‘‘Never, never, never give up!’ I was due to visit Chartwell House, so took time to snap some appropriate shots and plan the meeting. Karl Holton, crime writer, mentioned Agatha Christie in his interview so we had to set the interview in the library. I set the interview searching for the body, but he enhanced the interview with a brilliant, dramatic opening. Me: What is your favourite setting? Jessie: As a Yorkshire lass, I have to say York is my favourite setting in the UK. John Jackson, historical novelist, lives in York and it was a delight to visit. John’s book is based on his ancestors, and I enjoyed teasing out the history of his scoundrel ancestors in the town. Me: What settings have caused you the most trouble? Jessie: Collecting the photos for the interviews and the blog is an adventure, but it has got me into trouble. Recently, I was told in no uncertain terms not to place my handbag on the fireplace of a stately home. I have been chased away from an antique shop for photographing but not buying. When preparing for Ally Bunbury’s interview, I had to find a photo of glamorous hotel for the interview. Once I had found the hotel in Brighton, I persuaded the porters to help me to set up an original shot. I am mischievous by nature and get carried away in creative challenges. All the interviews are stories, and I must bring them to life with the flow of dialogue and original photos. Me: How much research do you put into each of your interviews? Jessie: The author’s comments are my starting point, but I always research the author’s books, website, Facebook pages and Twitter. This helps me to get a sense of how the author represents themselves and their work; sometimes I grab a couple of additional pictures from their Facebook Page. I constantly research new settings online, and grab photos of places I visit. I always have a notebook and phone in my handbag to capture any ideas. Me: You often feature book extracts. Which type do you think works best, eg dialogue, first few paragraphs? Jessie: Extracts with tension, comedy or conflict seem to work the best. It is better if the extract is original and not from the one on Amazon. The 250-word limit challenges the author to be selective, and think of framing their book. It does not matter if the extract is dialogue or prose, but the extract must work in isolation. Me: What are the ingredients of a really good author interview? Jessie: The author is the key ingredient in all the interviews. It is my role to host the author and find a way to let their personality shine through. I suggest a setting for the interview, but the author decides on the dress code and the food and drink. Once the author feels comfortable, we can develop the conversation and enjoy the interaction. Me: How do you keep up the pace of blogging, reviewing and interviewing as well as writing books? Jessie: I work from 7am until I go to sleep. I live, eat, and breathe the blog and writing. I try to dedicate most of my day to editing my book, but get distracted with interviews, extracts etc. Initially, I started blogging to share my reading and make connections with other readers and authors. I am very lucky that my husband looks after the IT side of the blog and is happy to translate my latest idea onto the blog. My diary of events has become very full. I ordered a great big diary for Christmas, but have realised that it won’t fit in my handbag. I am always looking for an opportunity to buy another handbag. My day is punctuated with social media activity and supporting authors. One of the indie authors I have worked with recommended an editor to me, and this process has opened my eyes. I have been re-working my book during the last couple of months and a new edition will be out soon. Me: Can you please give us a flavour of your own book? Jessie: You Can’t Go It Alone is contemporary women’s fiction. The novel explores the impact secrets can have on relationships and pursuit of happiness. Set in a Welsh village during the noughties, You Can’t Go It Alone reveals the contrast in attitudes and opportunities between different generations. Rosa, the leading lady of the Olive Tree Café, must face issues in her marriage. Sophie, a teacher, helps others to communicate but struggles to communicate with her husband, Jack, about their IVF journey. Olivia, who is coming of age, struggles with the pressures of fame. As they confront their secrets and fears, they discover surprising things about themselves and their relationships. This feel-good book has many twists and turns in the plot, but it also deals with the harsh realities of life. The reader is invited to laugh and cry with the characters, and consider how to find joy in the simple things in life. Thanks, Jessie, for being the interviewee this time round. You can find Jessie Cahalin on her blog, website, Facebook, and Twitter. I’m aware that Britain is rather special, if not downright peculiar. Coupled with a weak pound, that’s an asset that may well contribute to its perennial attraction as a holiday destination. In 2016, over 37 million tourists visited Britain, some 4% more than in 2015. Over the years, I’ve shown visiting friends from abroad some wonderful sights, and I’ve shared some enduring national traditions. These, in my view, are the top five things you can properly count on. 1 There’s always a downpour on a Bank Holiday weekend. If for some strange reason it turns out sunny, as it did last August, you can be sure we’ll talk about it for the next twenty years. 2 There’s always a queue at a National Trust tea-shop. The National Trust is the custodian of over 350 historic buildings, along with acres of land and miles of coastline. The menu in their tea-rooms is rarely complex, and some delightful people work behind the counter. Why then is the self-service line so long that toddlers wet themselves and the elderly give up altogether long before they reach the till? 3 English pubs are dying. Every year, about 900 more pubs close, though many find a new lease of life as an Indian or Chinese restaurant. The Mill, Cambridge. Still a traditional pub, for now. 4 Snow makes everything grind to a halt. British trains and roads aren’t built to cope with anything more than three flakes of snow. 5 The England football team consistently fails to impress. Yes, next year we might very well ‘go all the way’ and carry off the World Cup, but we’ve said that every four years since 1966. It would be lovely to think that Gareth Southgate is a national treasure, and that every England player is proud to step on the turf for his country. As I write, I’m watching England play Lithuania. It is apparently an artificial pitch, and the players are wooden. Can you think of anything else that so reliably evokes Britain?